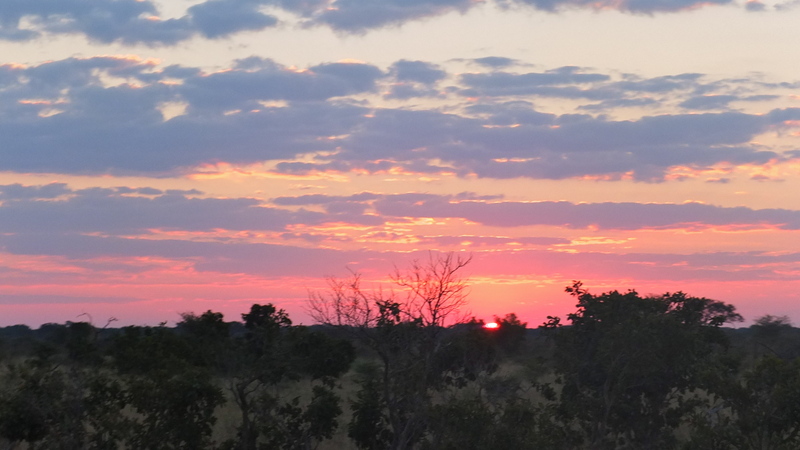 Our decision to drive to Harare by night paid off and we arrived on the outskirts in the small hours. The street lights were dazzling after the deep, rural darkness. The Rogers had told us about a park that allowed campers. This information was at least seven years old but we headed there anyway with little in the way of a plan B. We were tired and becoming short with one another. A silence replaced the previously cheerful conversation. The following hour of wrong turns and U-turns tested us further. The campsite was nowhere to be found. Eventually we decided that a gated building-site with the remnants of a communal garden were our best bet. There was no one in sight so we decided to put a tent up and try to explain ourselves in the morning. We were promptly ambushed by three police officers. After patiently explaining our situation to the startled guards, who had been patrolling the area, everyone calmed down. It was agreed that we were to stay and wait for the boss in the morning. We were so tired at this point that we would have accepted a night in a prison cell. His candour was refreshing after last night’s lengthy admonishments. Within minutes of straightforward business we were free to hit the town. On the surface, the Harare was functioning. Dollarisation had come in to remedy the astronomical hyperinflation of the Zimbabwean dollar. The Z$ had essentially been abandoned in 2009 when the government legalised foreign currency transactions whilst at the same time limiting cash withdrawals to 100billion Z$ (far less then the value of a loaf of bread). Inflation at this point was around 96% a day with extra zeros continually being added to the bank notes. US Dollars were fine for big purchases but life became difficult with change as there were only grubby dollar notes in circulation. South African Rand were sometimes used but more often than not the retailer would try and offer something of a similar value. A parallel system of barter had evolved. This lead to some complicated situations, such as me trading a pen to photocopy my passport and upon protesting that the pen was worth more than the photocopy, receiving my change in chewing gum. We spent the weekend in Harare, meeting people and organising our onward travel. Priority number one was, as always, to set up a base and get clean. Out in the countryside our grubby appearance fitted but now we were amongst business men, diplomats and politicians in shiny, shiny suits. We dug out what ‘smart clothes’ we had managed to preserve. At last, Dan put some shoes on and combed his beard but remained in his old scrub trousers as he had no others. It would have to do. 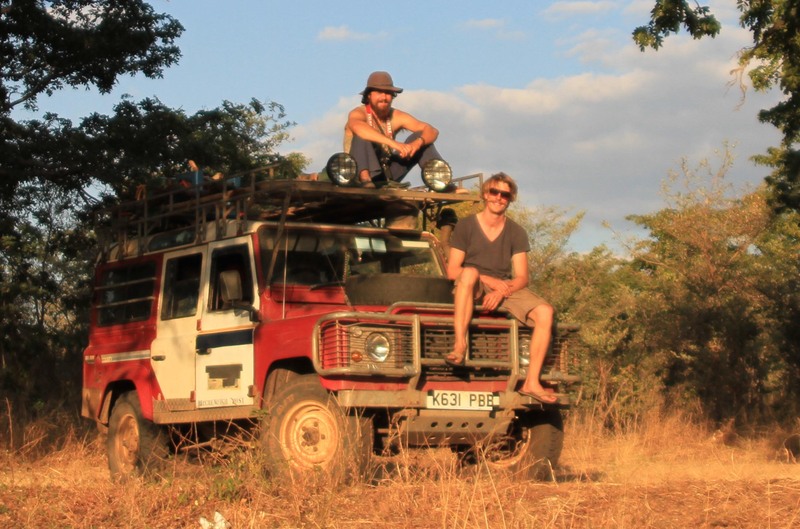 In a leafy hostel near the Zanu PF party headquarters, we met the few intrepid travellers who had made the leap of faith up from South Africa. We pitched our tents in the garden. Over an evening the group increased. Introductions were made in the easy way that people who are mutually far from home are able to do. We spun a few of our well rehearsed yarns and soon we had all been invited to an exciting event. On the other side of town the Zimbabwean Red Cross were having a fund raising concert in the -now disused- Mbare netball stadium. The huge concrete structure was testimony to the fact that Zimbabwe had once been a big player in international sport. Here, despite the nations economic problems, the great and the good of Harare were gathering to raise money to support the charity at home and abroad. Some of the evening’s big hitters included Fungisai Zvakavapano-Mashavave, Tryson Chimbetu, King Shaddy and my personal favourite the Dembo brothers; struggling to make a name for themselves in the shadow of their recently deceased father, the legendary Leonard Dembo. The evening was electric. Students, professionals, musicians and crowded in around bars and flaming braais. We were warmly welcomed. Up on stage each act gathered the crowd up to dance along. The Dembo brothers’ band in particular had lengthily and complicated dance routines to accompany their 20 minute songs. They had a classic Southern/Eastern African style with a syncopated easy rythm, a bouncing slightly independent base overlaid with joyous, melodic guitars and harmonised singing. How they were able to co-ordinate all this, whilst spinning and jumping in perfect unison, is totally inexplicable. We awoke the following morning groggy and aching from over enthusiastic dancing. With bags of clean washing and fresh supplies we packed up our tents and left the city in the direction of Great Zimbabwe. These ancient ruins from the 14th centaury had been known about since the early explorers. 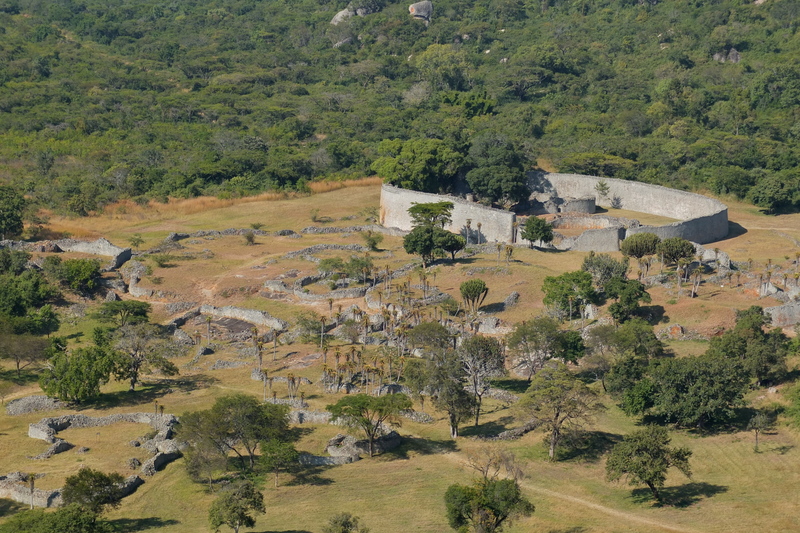 ‘Zimbabwe’ itself means ‘large stone house’ which doesn’t give much credit to the intricate, concentric fortifications. I had to admit that I had not heard of any ancient, stone buildings south of Ethiopia. The most amazing thing is how long the academic world was unable to conceive that the decedents of this great trade empire were the Shona tribe. 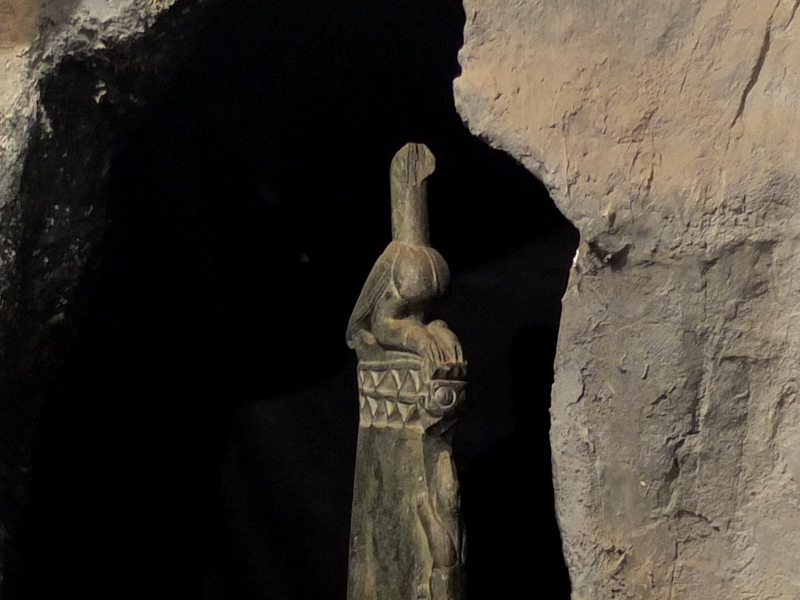 Complex theories were conceived to attribute the ruins to the Arabs or the Phoenicians. With the Rhodesian government, these theories gained a political agenda. Suggestions that the site was constructed by black people (or even that the ruins existed) were suppressed. The city had reminded us of how much more comfortable we were camping out in the bush. That night we made supper in the shadow of the hilltop ruins. We had a single-malt and sat up talking for some time. There was a chill in the clear air that we were unfamiliar with. Our route was taking us south with the winter. We crawled into out tent to lie like sardines, neglecting to pack up the food and plates. We rose early the next day, but not as early as the monkeys who we found industriously and systematically ravaging out campsite. From Great Zimbabwe we drove in an arc, through the Indebele tribal heartlands (the other main tribe of Zimbabwe of Zulu origin) and the city of Bulawayo. 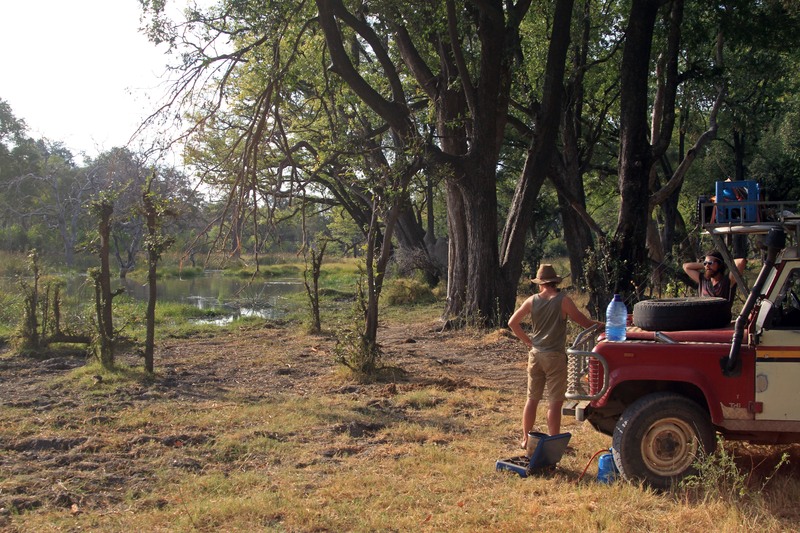 Dropping away from the central Highveld, the Western edge of Zimbabwe seemed to be an endless forest with little sign of occupation. At night we would drive for hours without seeing the lights of civilisation. 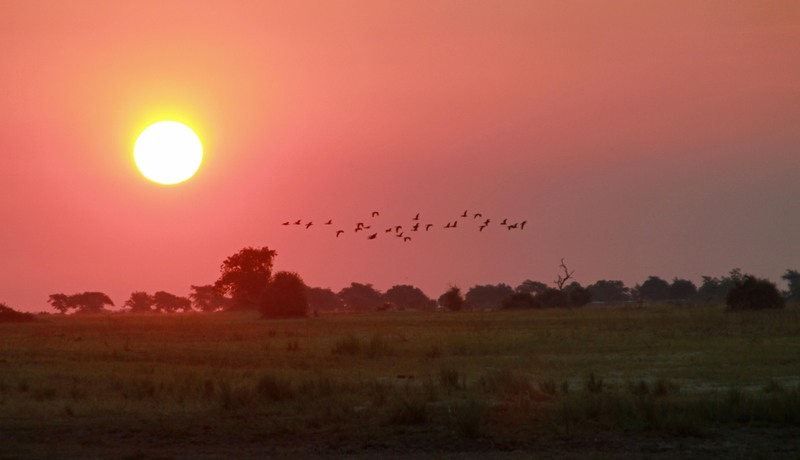 Our destination was Hwange national park. We reached the official edges of the park at the dead of night, although it seemed we had been in wooded wilderness for hundreds of miles. The forest was thick where we turned off to make ourselves invisible for the night. By spotlight, with the engine turning over slowly in low range, we wove our way through the trees, stopping occasionally to hack down a branch or trunk that blocked our path. 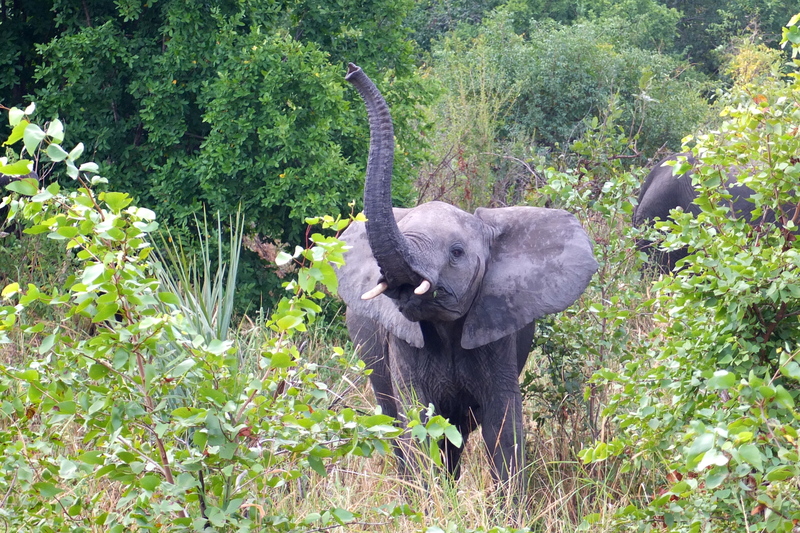 The signs of Elephant were everywhere. Splintered wood and ripped bark were scarred into the forest as well as mounds of dung in various stages of returning to earth. That night, the still air was alive with noises. I sat on the roof and listened to the yelping jackals and a howling lament that we later learned to be from the painted dogs. 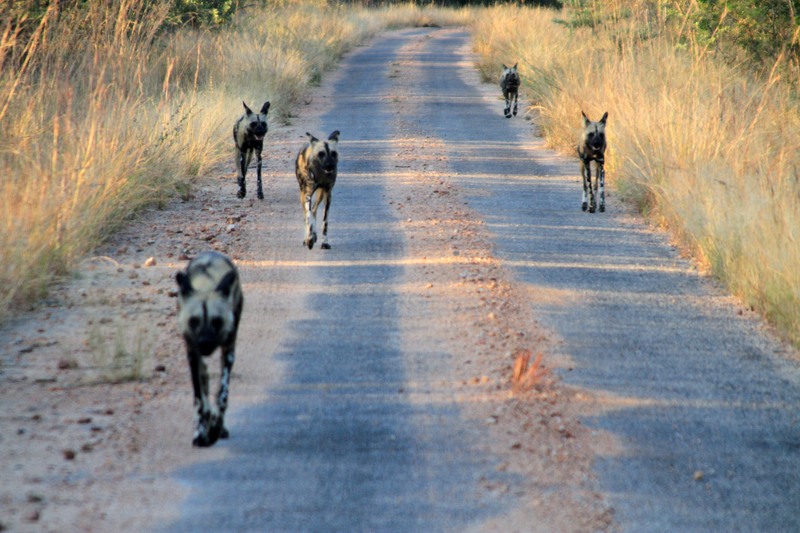 Occasionally there was the undulating peep of a Hyena contact call. This had become a night time ritual. We were comfortable in our constant vigilance. Camped on the forest floor, it was hard to go to sleep. Eyes closed, I placed each sound into a mental landscape; from the distant crashes to the sharp snaps that seemed inches from our resting heads. We strategically placed knives, clubs and machetes around the tent in case the worst came to the worst but mostly, we relied on hiding. I seemed to be the lightest sleeper. Rich, who was still suffering from hearing difficulties from his Kenyan ear infection, was the heaviest. 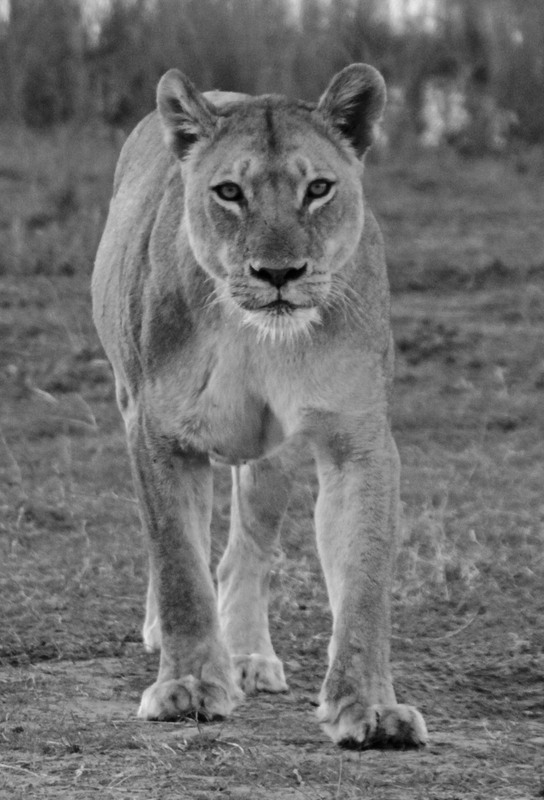 In Kenya I had hunched in moonlit terror as a bull Hippo roared and munched its way through our camp as he had dosed serenely. 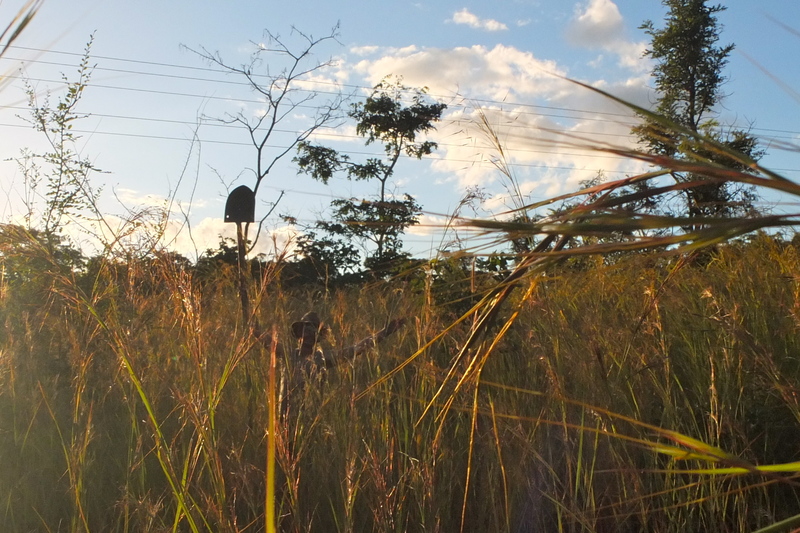 In Mozamique we had all lain awake in our thicket, listening to the nearby drumming and chanting that started up in the small hours where before we had been certain of our solitude. At this point I gathered the courage to leave the tent with head-torch and cudgel in hand. My narrow beam did little to cut through the encroaching night. The flicker of movement seemed to vanish behind every tree just before my torch fell on it. By the time a stern faced, boxer-short-clad Dan appeared, axe in hand, it was clear we were alone again. The only sound was Rich’s peaceful snoring. Across Mozambique, we had shifted back into a feral state. Almost every night had been spent hidden in the dense woodland or on deserted beaches. Both our cookers had simultaneously expired meaning wood fires were how we now prepared our meals. When our head-torch batteries failed, we were surprised by how we could set up camp, start a fire, move around the car and prepare a meal by memory alone; reading the familiar contents like brail. Our threshold rose markedly for things that scuttled and crawled over us as we lay in the tall elephant grass. We reached the town of Manica, near the Zimbabwean border. Our car was still without a working clutch, although drivable. Every traffic light became a spectacle of pushing and grinding until Tess jumped into gear. Every hill became a tense ordeal, teasing the gearstick to engage as we lost momentum. To make matters worse, our diesel tank was leaking when filled to over 20 litres. 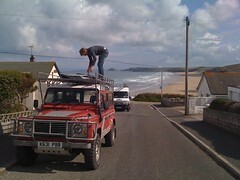 This meant we had to climb onto the roof and retrieve another Jerry can for the tank every 140 miles. One particular incident brought untold mirth to the town onlookers when Dan and I, having pushed Tess along the busy high street, ran to jump into the accelerating vehicle. Perfectly in time, I tripped over my flip-flops and Dan leapt for the door, bouncing his head off the top doorframe. We both tumbled into the dusty street as our car sped off. 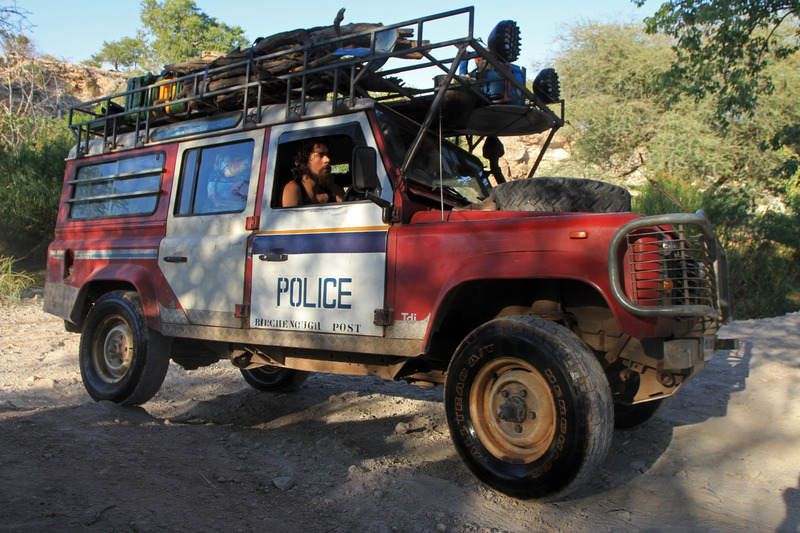 Mozambique is not a Land Rover friendly country and we were advised to try our luck over the border in Zimbabwe. The problem was that the border was atop a steep hill with a perpetual traffic queue leading up to it. We had to have momentum to change gear. If we stopped on a hill, we would have to roll back down to the flat and try again. Such antics were unlikely to amuse the border officials. We tried to learn more about the road ahead. The currency of information in Africa is traded differently. Back home, knowledge is cheap and available. The location of an amenity, the state of a road or the situation in a region are all a button click, or at least a phone call, away. Across Africa, we had learned to appraise and amalgamate the spectrum of conflicting opinions on any one question. Everyone is an ‘expert’, each has their version of the truth and many have an interest in skewing the reality. 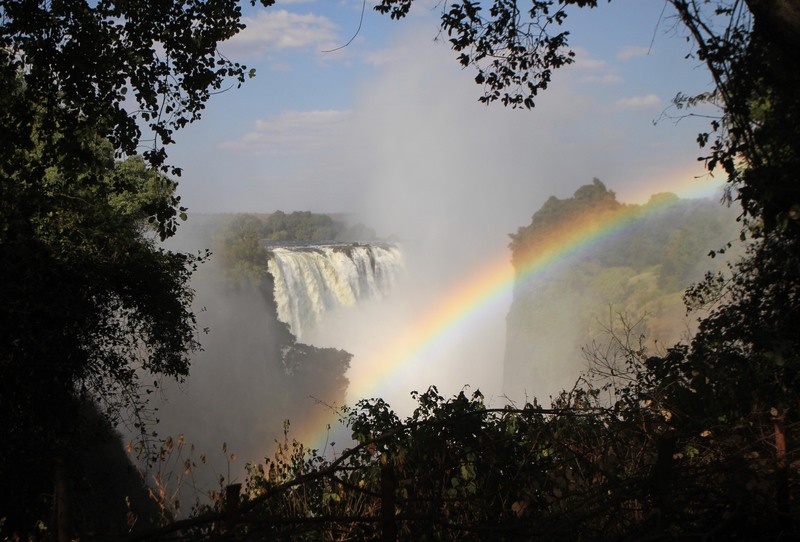 Zimbabwe appeared to be enigmatic even to those a few miles from the border. “The elections are coming and the trouble is building,” our hostess at the flamboyantly named ‘Pink Papaya Hostel’ told us. Zim was one place for which we certainly held preconceptions. The last decade had provided ample images of the infamous land reforms, the hyperinflation and the seemingly runaway violence to all opposition. My dad had visited during the closing stages of the war of independence, during the transition from Rhodesia to Zimbabwe. The stories had captured my imagination. He had helped his friend campus for the Bishop Muzorewa in the 1981 election that bought Mugabe to power. He would reminisce on how beautiful the country was. We had met scattered Zimbabweans along our journey: displaced white farmers, economic refugees and former soldiers, all with their stories. The more we found out, the stranger and sadder the history became. We picked up an old guidebook for Zimbabwe published in 1998, before the country had seemingly imploded. It cautiously praised Mugabe for developing the county’s economy and for his moderate treatment of the white minority. Although it was certainly a one-party state and rumours of well concealed brutality were beginning to filter through, it seemed Zimbabwe was (by African standards) on an even keel. What had gone so wrong? We heard theories: How Mugabe had been challenged in his role as ‘benevolent dictator’, how ZANU PF were losing influence and lashing out, or simply how a party with a sense of entitlement and ‘history’, having fought for independence had degenerated into a disorganised kleptocracy. Unlike the opportunism and banditry, which we had singed our hands on so far, the danger ahead seemed more targeted and sinister; less easy to prepare for. The spectacle we caused, pushing our rickety car through the streets of Mozambique could draw unnecessary attention from an authority with a particular dislike toward the British. All these fears were checked however, by our lack of an alternative. We had to push on. On a quiet, sunny afternoon we found ourselves beneath the border-post. We regarded the line of freight queuing up and spotted the distant barrier at the top. We had one chance. We rolled the car forward and she lurched into gear. There was no stopping as we weaved through the beeping lorries. Up ahead, a gap was closing. We snuck through just in time and pulled up on the flat, inches from the barrier. The usual crowd of touts, pretending to be officials, gathered around to force their help upon us. They were scattered by an armed guard. He looked the car up and down with a neutral expression before breaking into a smile. Dan and Rich went to arrange Visas and I stayed with he guard. I offered him a couple of our European Marlborough Reds which he smoked with relish. Conversation sparked up as the touts re-formed. There was no menace and our story was met with a measured consideration. These men seemed smart, educated and comfortable with discussing the world outside. They were also quick to joke, with a fatalistic sarcasm and a sense of the ridiculous that reminded me of home. Their English was rich in outdated words and aphorisms. “The supervisor is having lunch, so I suggest you make hay whilst the sun is shining,” the security guard beamed. The people behind the glass were equally as friendly and insincere. Apart from having to pay an extra-expensive Visa for being British we were through with no problems. 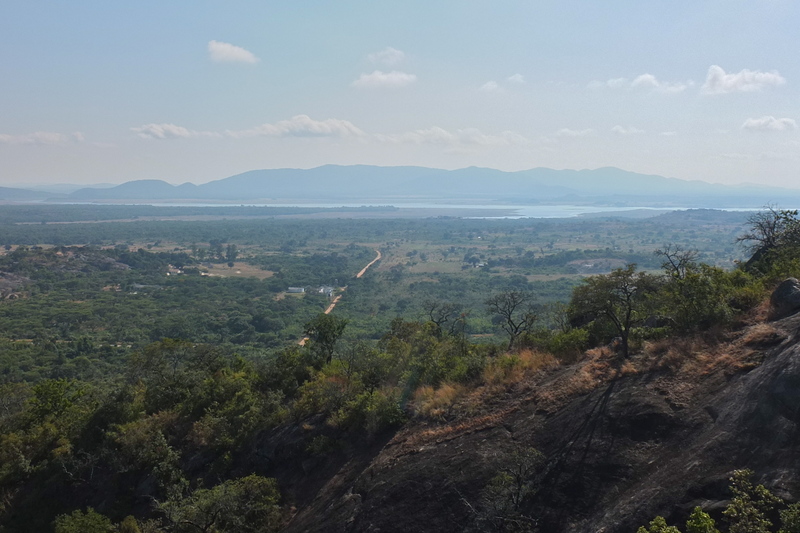 Nestled in the eastern hills, under pink granite mountains, lies the city of Mutare, Zimbabwe’s most beautiful city. Unfortunately much of the scenery was lost on us as we pushed our car through a frustratingly western system of traffic lights. The streets looked faded but functioning. Shops were open and cars lined the streets. The cities had been protected from the worst of the economic turmoil and violence that had raked the countryside. Furthermore there was now a large wealth divide. There was still money to be had and some people had found it. A large part of the new elite were associated with the ruling party. During the hyperinflation crisis many Zanu PF men had actually made fortunes by buying dollars at falsely low government rates and selling them on the black market for their actual price. Then there was the diamond rush. We heard about this a few days later. We had settled in Mutare for a week to sort out our car. We had caused a predictable spectacle and most people seemed to know of us. “How is the Defender?” two sharply-dressed, unfamiliar men enquired from their table. We had just walked into a cafe for lunch and sat with them whilst we ate. They were -or rather, had been- diamond traders. They told the story of how a British company had been sitting on the place for decades before the government seized it. They were unable to control the resource however and soon an entire black economy had sprung up. All the shady characters from across Africa arrived in town. The army had been forcing locals to dig, with the extracted wealth dispersing up the ranks. The desperate locals would also break in to dig the fields at night, selling their findings for tiny fractions of their value. Young opportunists from the town became rich as middle men. Mutare had its boom when the rest of Zimbabwe was sinking. When the party found out its response (operation ‘No Return’) was typically brutal. Our new friends wouldn’t talk much on that. They were much keener to reminisce on the glory days. We found out later from a white petrol station owner who we befriended, that helicopter gunships had been called in to clear all the land of people. The myths of the death count vary wildly and in Zimbabwe, where so much is kept secret, myths are all they become. 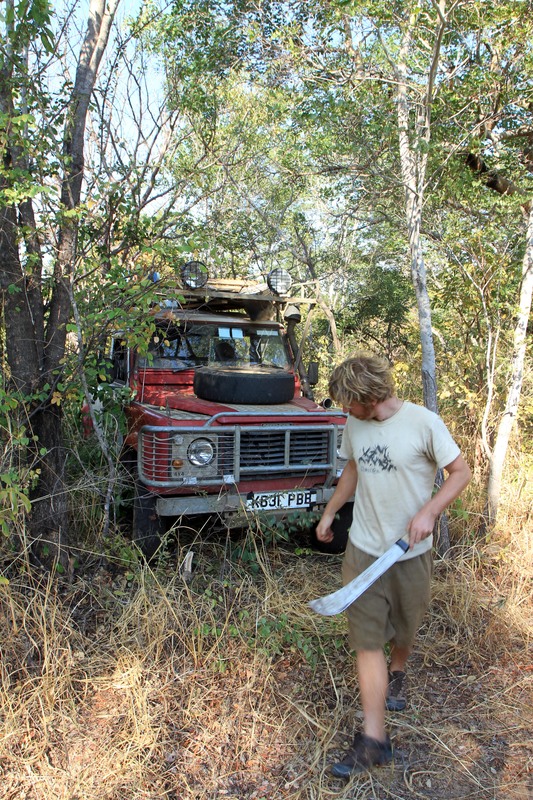 As it turned out, Mutare was a haven for a Land Rover in need of some TLC. 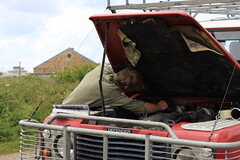 We were referred to ‘Quests’ an old and respected garage who clearly knew their way around a Landy. We frantically waved our way through a barrier, unable to stop and pulled up onto the large forecourt. A great bear of a man named Joseph greeted us with a smiling team. He was quick to learn our first names and had a playful air of authority. We spent many an hour in his office talking on the state of the country, life in the UK and the nuances of Mashona culture (his tribe and the current dominant tribe of Zanu PF). He patted a sheepish mechanic on the back. “Now we have to employ people like Jason. Ha!” -Jason was, in reality very capable. They fixed our mangled clutch, finding and negotiating cheap spare parts. Nearby was a breaker’s yard that Dan and I went to investigate. What we found took our breath away. It was like walking into some sacred Landrover Graveyard. They were piled high in various states of decay. We had everything we could need. All those days scouring the cities of north and east Africa for spare parts seemed so barren and arduous. We decided to replace all of our remaining original doors. For this we selected one Zimbabwe Police (Birchenough post) door and one Zimbabwe Electrical Company door. This would give our ramshackle steed its signature appearance. On the day we left Mutare, I was walking down the high-street when I noticed that there was police officer stationed at each corner. A crowd gathered on the pavement as the first cavalcade of motorbikes in slow formation passed us by. ‘His Excellency’, Robert Mugabe was arriving. Next to follow was a troop pickup with six gold-helmeted gunmen, then two ambulances, a firengine, a further twenty of so motorbikes and more gold-headed troopers. In the middle were a cluster of black SUVs and one garish, gold Range Rover. We later found out that the president was in town to announce the date of the national elections; July 31st 2013. There was much anticipation for this oncoming event. We made a habit of not asking people about their political affiliations but there seemed to be a strong trend amongst the people we talked to that the country was tired of the regime. They were also dreading a repeat of the unspeakable and unspoken violence of 2008. The hills above Mutare were lit with a golden sunlight as we left. It was a light never seen nearer the equator where the sun is either ‘bright’ or ‘off’. We were moving out of the tropics again. The reasonable roads were surrounded by bush and ramshackle smallholdings; apparently once productive, commercial farms. Before our journey to Harare we had one last call. 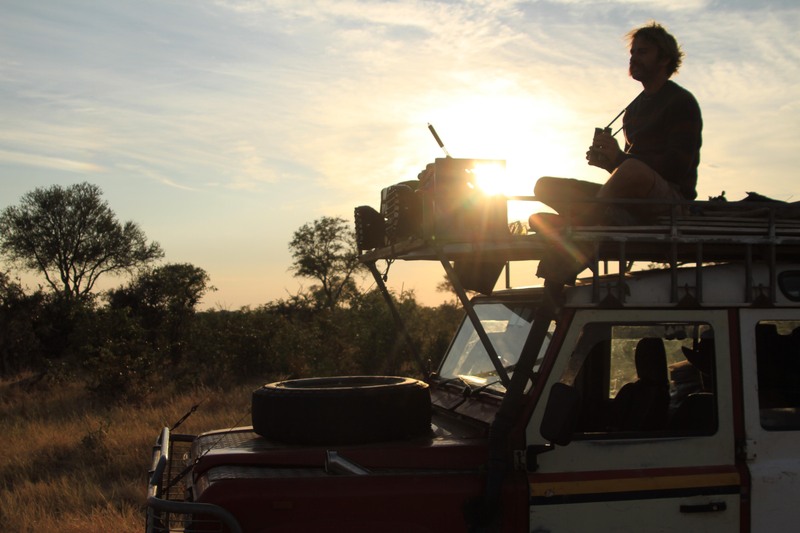 As the sun drew low we turned off the main road to Drifter’s, once a well-known backpacker retreat and the scene of one of Zimbabwe’s greatest recent stories. We drove up the dirt drive, through houses nestled in the trees. We we’re greeted by an old man who introduced himself as John Muranda. I didn’t tell him that I had read all about him. Back in Ethiopia Claire, our solo, overland motorcyclist friend, had given me a tattered copy of ‘The Last Resort, a Memoir of Zimbabwe’ by Douglas Rogers. The patient and humanistic story of how the Rogers, their employees and lodgers had survived the chaotic events of the last decade had captured my imagination. It was amazing to visit the place and meet the people I had read about. Lyn and Ros Rogers were still on their land having evaded, negotiated and adapted under constant threat and turmoil. The were at home and came down to have a drink with in the hostel bar. We watched the sun set through the dense hillside trees and talked about the South West UK, The various over-landers who had come before us and the coming elections. “In a mad way, I feel slightly sorry for the poor old man,” remarked Lyn to my surprise. We were talking about Mugabe. After all ZANU PF had done, both to the country and to the Rogers, it was surprising to hear these understanding tones. Of course, Zimbabwe’s decline was more complicated then the actions and mistakes of one man. We left under darkness to begin our long journey to Harare, driving through the night to avoid the police road blocks. 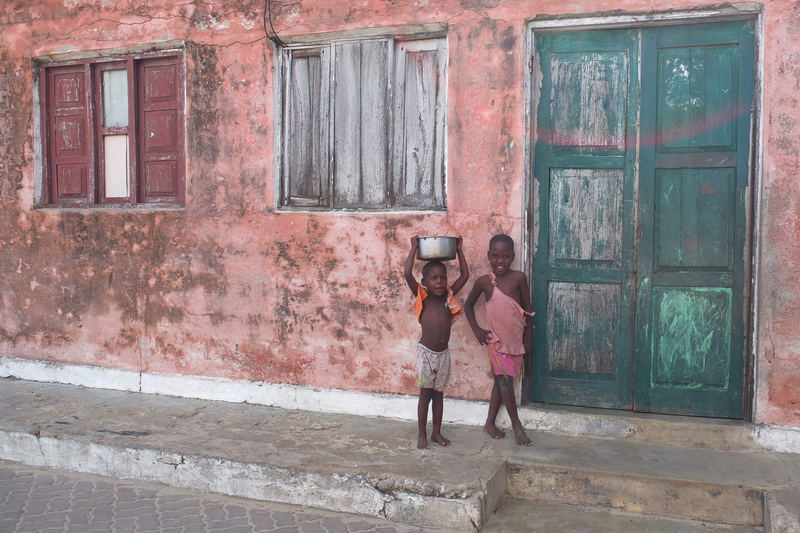 In Mozambique, ghosts of Portuguese and Swahili settlers wander amongst faded colonial grandeur, unnoticed. The inhabitants of the remote north have quickly returned to the lives that they lived for hundreds of years before the colonists arrived. The only memories of the old times are the Portuguese language, the food and pastel mansions crumbling among the mud huts. Over several hundred kilometers the road from southern Malawi to the Indian Ocean deteriorated from tarmac into a mud track, furrowed and ruined by rainy season run off. Villages became less frequent until we found ourselves driving through thick tropical forest bare of any kind civilization. This was a welcome change after seeing nothing but hand-ploughed land since the Sahara desert. 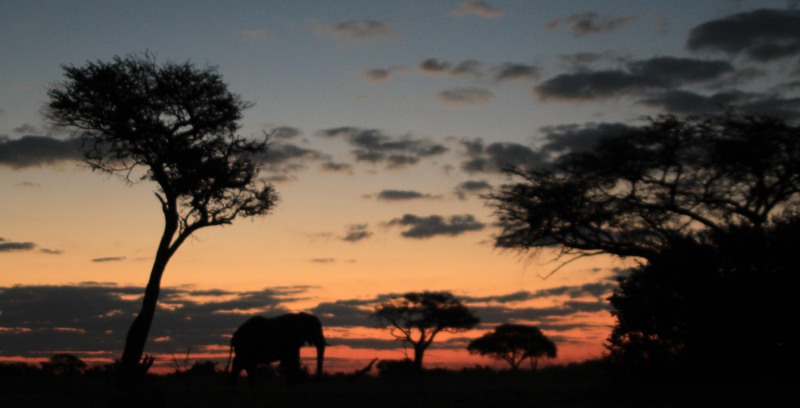 It did not really strike home how densely and universally inhabited Africa has been until we found a place that wasn’t. Camping in this thick jungle was not easy. We had to pick a path through the thorn bushes, creepers and giant car-trap spider webs. 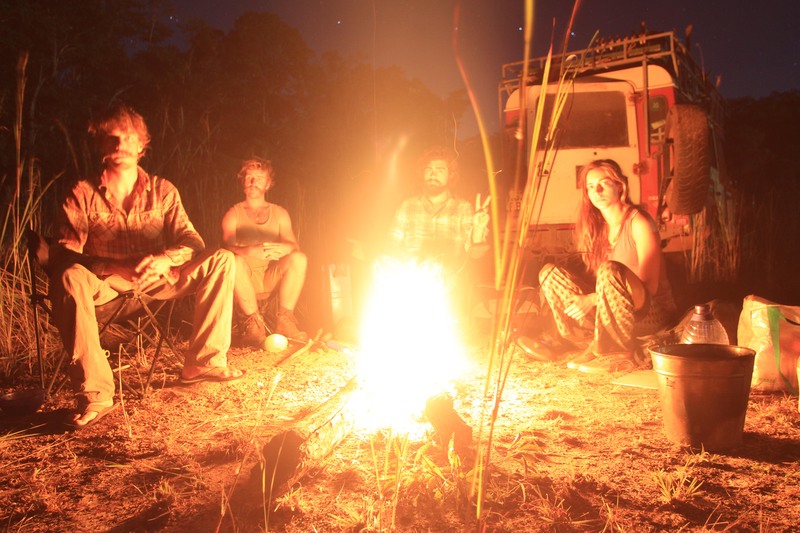 It was worth it though, to sit tight around our campfire, to listen while distant drums beat from a wild Africa that flowed out wide and black beyond the flickering light. Driving so far away from civilisation was exciting but came with a little apprehension. What would we do if something happened? What if the car died or even worse, a crash? The road was white sand and stones, flat and unused but blighted with potholes that could swallow the car. Driving at midday is the most treacherous. The sun sits high overhead and casts a flat light that renders all the bumps and holes in the road invisible. It was under these conditions that we lost control of the car. At 40mph a sea of potholes materialized from the blinding white road and knocked Tess into a skid. 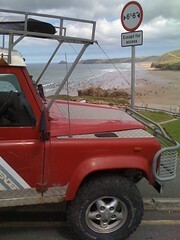 The back of the landie drifted out wide on the carpet of small rocks. Bas pulled it back but we swung out the other side even more violently. For 150 yards we skated across the surface, each exaggerated skid brought us closer to flipping over. The rubber of our tyres squealed under the strain and the luggage flew around possessed. One by one we lost our cool and started to scream in fright. 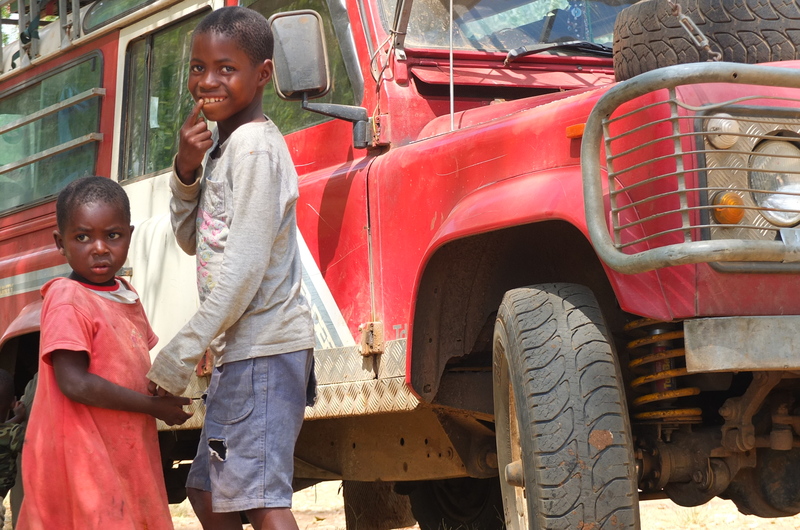 Bas wrested control of the steering and ditched the car over the edge of the road, down a gully into tall grass where we rolled to a halt, every one breathing hard. We stepped out of the car, a little shaken. Rich crawled underneath to assess the damage. Nothing seemed wrong. We couldn’t believe we had been so lucky, or unlucky depending on your point of view. Tess creaked back up the embankment onto the road and set off again towards the coast. As we drove, my mind was filled with imagined scenarios. 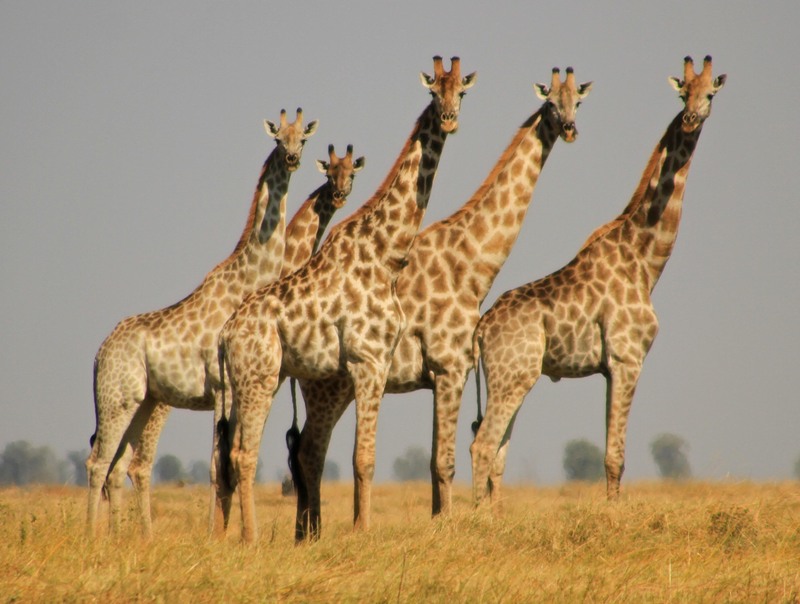 People say that above the bandits, the terrorists and the wildlife you are most likely to come a cropper in Africa as a result of the roads. They are right, and what would one do if it happened miles away from the nearest civilisation. Our near miss brought the reality of a serious injury or massive mechanical failure into sharp focus. Would we have enough food? Who would go for help? Someone would have to walk to the nearest village for assistance and it would likely take several days, longer still for the people waiting with the vehicle. It seems there is a reason the road less travelled is not, well, more travelled. 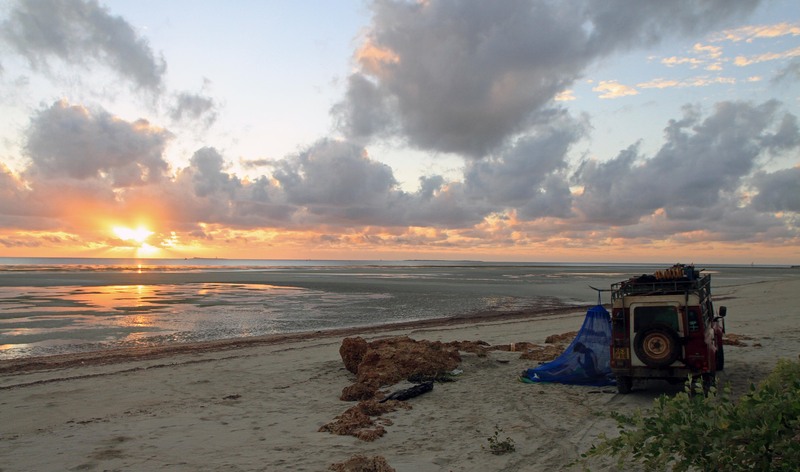 Ibo, a tiny island a few miles off the North Mozambique coast at Pemba, was our destination. At the end of a sandy track, too bright for my cheap sunglasses, were a large baobab tree and a driftwood kiosk selling cokes. We left Tess in the hands of the kiosk man to guard and took off our shoes. Wading through the mud into the shallow mangroves we approached a dhow bound for Ibo. Ibo is an abandoned colonial holiday spot scattered with decaying buildings. White sand and sharp crags of black volcanic rock encircle the island. The atmosphere on Ibo is very much that of island life. Nothing happens too quickly, everyone knows one another and there is no crime. On our second day in Ibo a small boat took us out to snorkel at a shallow reef. The water was a warm, blue world. The coral was dotted with great wrinkled clams that snapped shut in a fizz of bubbles when I touched them. I have never scuba dived and this underwater landscape was a new experience for me. It was thrilling to dive and mingle with the marine creatures imagining for brief moments that I was allowed to be one of them. 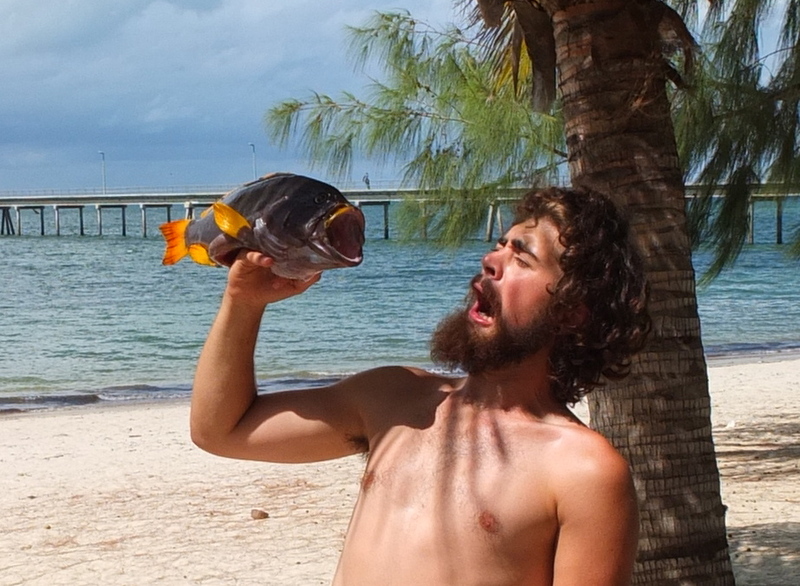 I wore myself out chasing bright little fishes through coral corridors. They flitted easily away from my pursuit like sparrows escaping a hawk. Our boat chugged slowly through the chop as we returned from the reef, our skin drying slowly in the low sun. All of a sudden the Captain shouted to us from the wheel, the engine rattled and cut out. Warm and a little dazed I pulled my fins on and bowled out of the boat. The cold water broke on me with a start and everything was suddenly silent and black. The open sea was cold, dark and deep. Alone for a few seconds before the others plunged in beside me, I was taken by a trace of fear. Perhaps it was the chill, or the deep unknown beneath me but it felt unnatural after the shallow, colourful reef. Quickly a shadow passed below me, easy and swift. It banked left and joined three more shadows. Each beat its tail hard and then whipped off into the blackness. They came again, this time closer, slowing as they passed. There were four dolphins batting though the water, wet pebble eyes considering me as I floated. I kicked hard to get close. They did not flee, they flanked me slowly as if to encourage me to come with them. Arched streamlined backs, they began to dive. Snatching a breath I dived down with them and almost imperceptibly the nearest glanced back at me, noting that I had followed. The four strong bodies spiraled deeper and deeper. I could not keep up. I returned to the surface, panting. Several more times they passed us; we were awkward in their world. They urged us to play, but our sluggishness disappointed them. After a while they left us to find better sport and we returned to the boat. Everyone was vibrating from the encounter, speechless and yammering at the same time. The interaction was magnetic. A simple, good-natured relationship had developed in only a few minutes between each of us, alone in the dark sea, and a pod of dolphins. The experience was alien and yet wonderful. As we set out for home we saw the pod coursing ahead through the water. The furthest of them leapt out of the surf sending a fan of droplets from its dorsal fin that caught the light. At dawn the following day we returned to the mainland. The dhow sailed nimbly through the shallow mangroves bringing island women and their wares to the market in Pemba. Huge cloth wrapped baskets and nylon sacks filled the small boat’s hull leaving only the edges for numerous passengers to jostle for seating above the spray. 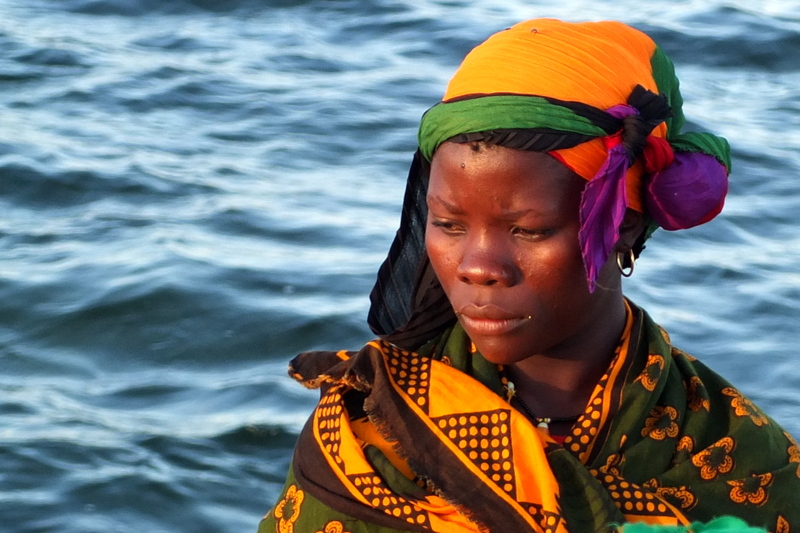 The bright and beautifully patterned clothing of the Mozambican women was striking in the dawn light. The lines on their sun-weathered skin were also worn well. The road south from was smoothly graded, prepared by the Chinese for the construction of a new highway. Natural gas has been found off the coast so Pemba will soon be the newest raw material exploitation centre in Africa. This will probably lead to a brief explosion in the tourist industry on Ibo and surrounding islands. The property will be bought up and converted to luxury hotels for the gas company employees. In a few years the gas will dry up, the industry will leave and the island people will once again return to their small, quiet lives. 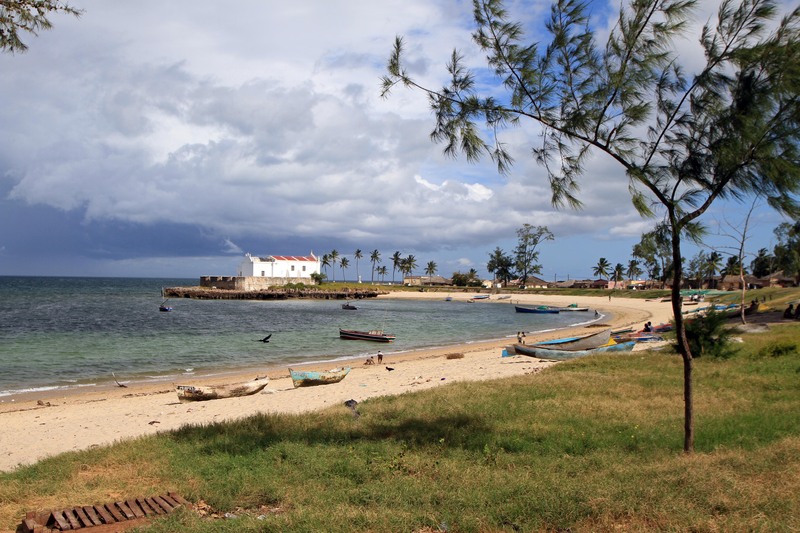 In Ilha do Mocambique the contrast between old colonial majesty and island tradition is also stark. The main square is cobbled black and white like the streets of Lisbon. The tessellated motif imitates the pattern left in the dust after island women have swept the earth in front of their door. The market brims with fruits we had never seen before, breadfruit, flat bananas, sun-dried mangos. At the seafront young men skip up the streets from the fishing boats with the catch of the day, sharks in their arms and rays on their backs. Old ladies hunch over charcoal fires cooking red snapper on skewers. Tongues of flame lick the spiced fishes, drops of lemon spit and crackle. With a huge tropical fish for our dinner we left Ilha and drove down the coast. A few kilometers after the last village we made a way through the bush to the beach and lit a fire. After a brawl with numerous large purple spines and several punctured fingers our meal was scaled and ready. The fish cooked on the wood fire while we lay watching the southern constellations track the sky. These shapes that had been so foreign to us now seemed like home, more so even than the northern stars since roofs have become a rarity. As we waited for our dinner we mused, even fretted a little about how much the trip has changed us. We have occasionally entertained worries that we would not easily reassume our old lives. After eight months speaking almost exclusively with each other, how will we converse with people whose opinions, habits and characteristics are unfamiliar? How will we kick habits like walking barefoot through the middle of town or showering only twice a week? Skills we have learned which are indispensable here will quickly become useless back home. The capacity to sleep soundly in a hut that is crawling with spiders as big as your hand will no longer be necessary in Cornwall. The ability to gather wood, build a fire and cook a fish on it will also seem distinctly obsolete when we cast our mind back from the queue in a fish and chip shop. Perhaps the most difficult thing will be to reintegrate with western opinions. There is a marked difference between the acceptable topics of conversation in Africa and at home. In Cornwall a few eyebrows might be raised if we try to argue the benefits of restoring the ivory trade, discuss Mugabe’s commendable achievements before the economic collapse or the futility of charitable work in Africa. On the other hand it will probably be good for us to learn to keep our opinions to ourselves occasionally. The fish was great. In the morning we lifted our mosquito nets to see the sun creeping into the world over the brow of a shimmering silent sea. The earliest fishermen were scudding along the horizon in their shallow bottomed sailing boats as we paddled about in the water. It was difficult to leave such a lovely scene but like on so many other perfect mornings we packed up and set off to the next destination on our journey. 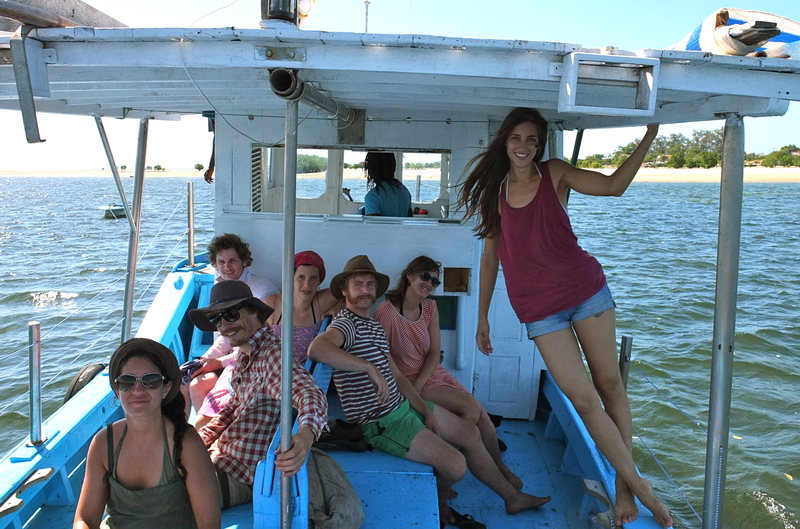 We were heading to Chimoio where Alki would find her bus to Tofu in the south of Mozambique. Alki would leave the trip for a couple of weeks to go on scuba safari, pursuing giant manta rays. On the road to Chimoio our clutch failed, the first major mechanical failure of the trip and real disappointment so close to the finishing line. At the side of the road, in the midday heat dismantling the master and slave cylinder. We succeeded only in making the problem worse however as we were unable to put it all back together. The only solution was going to be to remove the engine or drop the transfer box. As we did not relish the idea of doing this at the side of the road we decided to attempt to drive without a clutch until the next big town to get it fixed. The next big town was Mutare in Zimbabwe. After dropping Alki at her bus we departed for Mutare making quite a scene. In order to set off we had to push the car up to first gear speed. Then like a bobsled team we were to run alongside the moving vehicle and leap into our seats. What actually happened was Bas and I both went for the same door, in confusion I trod on Bas’ flipflop tripping him onto the tarmac. 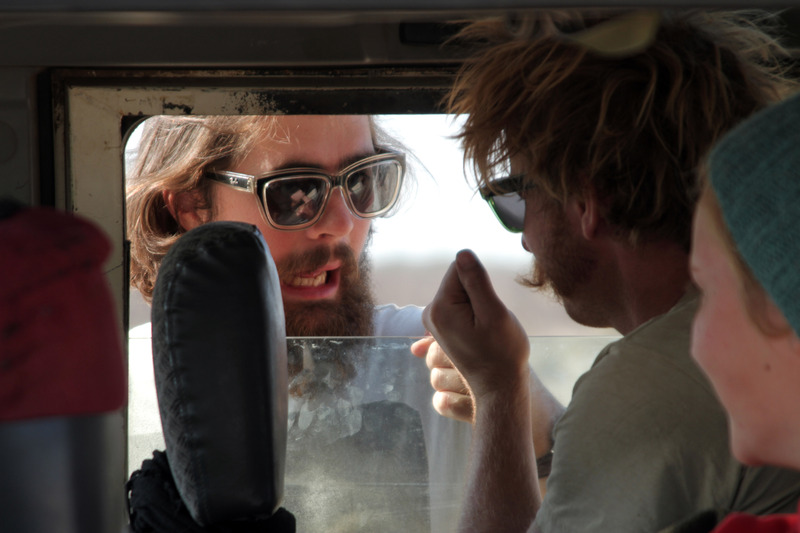 I then jumped for the door, hit my head on the frame and bounced back out to join Bas on the tarmac. These antics were viewed by large crowd of market goers and pedestrians who all dutifully cheered and jeered our ridiculous display. There was a similar farce at the Zimbabwe border crossing. The border is on a slight incline so we recruited the help of the surly border soldiers. They reluctantly put down their AKs to throw a their weight behind Tess, who choked and jerked into gear and pulled away leaving them in a cloud of black smoke. Welcome to Zimbabwe.